The Supreme Court has clearly proclaimed that peaceful boycotts reside on “the highest rung of the hierarchy of First Amendment values.” (NAACP v. Claiborne, 1982). Anti-BDS laws have already been struck down on free speech grounds by federal courts in Kansas and Arizona. The anti-BDS provision was wrapped up in a larger bill that guarantees $38 billion in aid to Israel, secures security cooperation with Israel and Jordan, calls for potential sanctions against some Syrian officials and entities and rebukes President Trump’s policy in Syria by asking him not to withdraw American troops from there. “Laws that prohibit state contractors from boycotting Israel are attacks on the First Amendment,” U.S. Senator Chris Van Hollen (D-MD), said during a speech on the Senate floor on Tuesday. “These laws are blatantly unconstitutional,” Van Hollen said. Twenty-six states, including Michigan, already passed similar anti-boycott laws. The Senate passed the bill overwhelmingly, by a margin of 77-23. Twenty-two Democratic senators voted against it, including notable figures like California Sen. Dianne Feinstein and potential 2020 presidential candidates Sen. Kamala Harris (D-CA) and Elizabeth Warren (D-MA) and Sen. Bernie Sanders (I-VT). Sadly, our two Michigan Senators, Debbie Stabenow and Gary Peters, voted in support of the bill. 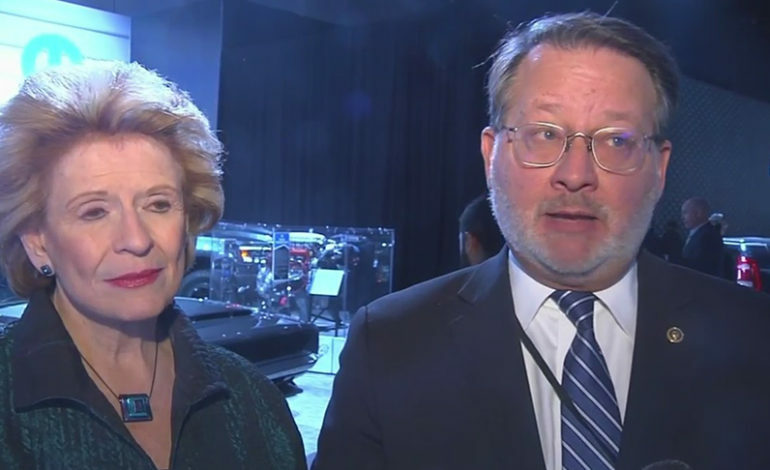 Stabenow’s vote came after she assured the Arab American community, in an interview with The Arab American News during her reelection campaign last year, that she would oppose any attempts to punish supporters of the BDS movement. She also met with community leaders earlier this week to hear their concerns. Nevertheless, she reneged on her promise and voted against our First Amendment rights on Tuesday. On Tuesday, Peters rose on the Senate floor to address the unconstitutionality of the act. “I believe there are serious questions about how this bill will impact the First Amendment rights of individuals who contract with state or local governments in a professional capacity but choose to boycott Israel in their personal capacity,” he said. During a meeting with Arab American activists in December, Peters assured Arab Americans that he would oppose the bill if it surfaced in the Senate again. The free speech rights of all Americans should always be paramount. Our senators must put the Constitution before any special interests or foreign policy objectives. In these respects, Stabenow and Peters have failed. Further, this bill would disproportionately affect Arab Americans, as we have a long history of boycotting Israel as a form of nonviolently protesting what we see as its consistent violations of human rights and international law. Both of our senators have broken their promises and our trust. While we understand that we will have political differences on the substance of the Palestinian issue, even with our friends, we expect that our elected officials should, at a minimum, vigorously protect our free speech rights to speak our minds. In casting their votes this week, Stabenow and Peters have told us that shielding Israel from criticism and boycott is more important than the civil rights of Americans and the essence of the U.S. Constitution.